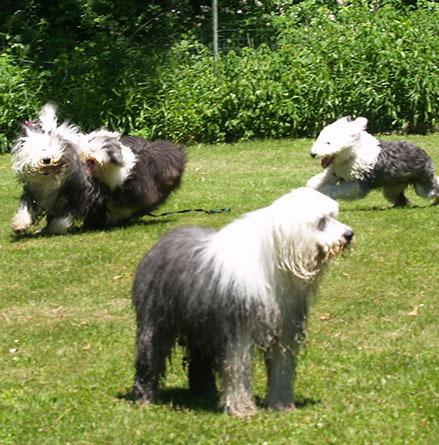 New England Old English Sheepdog Rescue, Inc., (NEOESR) was established in October 1994 as a 501(c)(3) charitable organization dedicated to helping Old English Sheepdogs in need of new homes. The journey towards establishing the group began in 1964 when Annie Raker, also known as Grannie Annie, was asked to find a new home for an OES named Charlie. At that time, Annie was a dog breeder and she knew lots of people who were supporters of the breed. After she successfully placed Charlie in a loving home, she was off and running with re-homing dogs. After thirty years of working in OES rescue in other venues, Grannie Annie co-founded NEOESR. The official NEOESR logo, a drawing by artist Eve Andrade, depicts Charlie, the first dog placed by Grannie Annie. Since NEOESR was founded, the organization has placed more than 2,000 dogs.